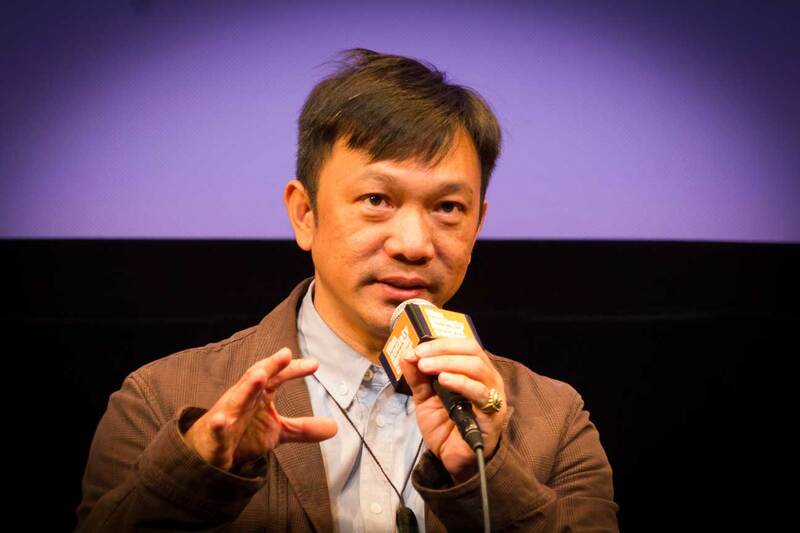 Before directing the 2017 film festival hit The Great Buddha+, Taiwanese director Huang Hsin-yao only made documentaries. 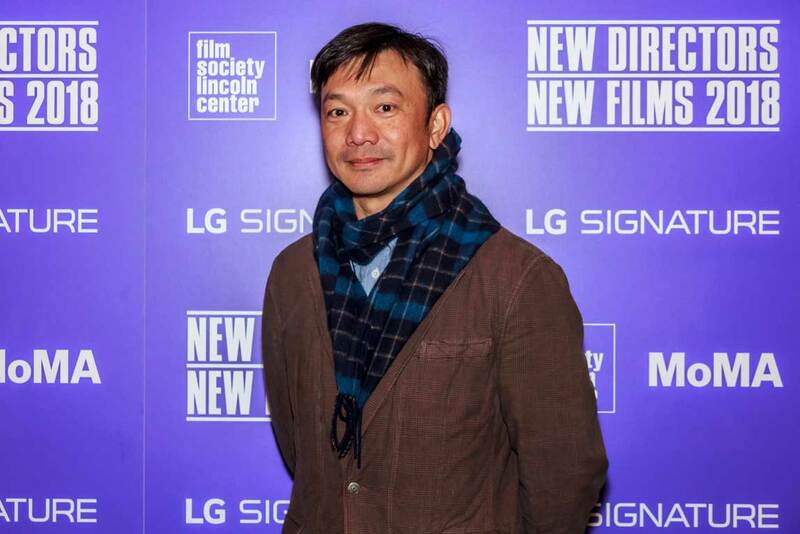 Shaped by a unique directing style, Huang’s past documentaries include Taivalu and Dogs with Man. In Taivalu, Huang injects sarcastic narration while documenting how Tuvalu—a South Pacific island and one of Taiwan’s few formal diplomatic allies—is sinking due to global warming. Through Dogs with Man, Huang offers a humorous tale of a controversial public figure named Ke Tsi-hai and his relationship with stray dogs. The Great Buddha+ continues Huang’s trademark sarcasm and humor. Its protagonists Pickle and Belly Button are two losers at the bottom of society. Belly Button works as a recycle collector, and Pickle is a night guard at his boss’s factory: where a great bronze buddha statue is being built. Through their eyes, we meet a variety of other characters, some in better social positions than others, yet all struggling to live in a world where classism defines human interaction. One night, bored out of their minds, Pickle and Belly Button decide to peek at Pickle’s wealthy boss Kevin’s dashcam. The footage reveals an exciting world—late night roadside hookups, visits to expensive love hotels—and a bitter dispute between Kevin and an old lover. 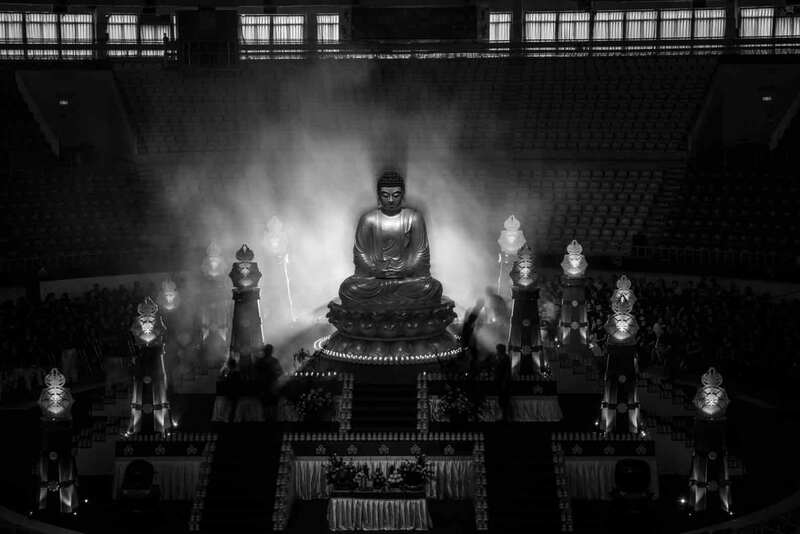 Most of The Great Buddha+ is shot in black and white, with color dashcam footage as the only exception. Whether this contrast meant to highlight the gap between rich and poor in capitalist Taiwan, or had more purely artistic rationales, it adds to the film’s distinctive character. Cinema Escapist interviewed director Huang Hsin-yao to learn more about his motivations and artistic choices behind The Great Buddha+. The interview transcript follows. Was The Great Buddha+ inspired by the Sunflower Movement? The Great Bhudda+ doesn’t have anything to do with the movement. I started shooting The Great Buddha [the short that The Great Bhudda+ was based on] right as the Sunflower Student Movement was happening [in Spring 2014], but I wrote the short’s script a year before. However, the movie is inspired by my grievances towards Taiwanese society. These grievances aren’t directly related to social movements, but I do have an overall concern for the state of Taiwanese society. While I stopped actively partaking in social movements after graduating from school, I still read about them and made documentaries about them. That’s how I show that I care. By 2013, I thought of writing a story that reflected the state of Taiwanese society. Taiwan changed quite a lot from 2013 to 2015, and a lot of distinct social issues have surfaced. Nevertheless — The Great Buddha [and consequently The Great Buddha+] aren’t based only only those issues [from between 2013-15]. Rather, they’re a culmination of a more general sense of social awareness that I’ve personally cultivated from high school all the way to my early 40s today. What drove your decision to film the movie in the Taiwanese language (as opposed to Mandarin) and in black and white? The decision to use the Taiwanese language in The Great Bhudda+ came naturally. My stories are based on my surroundings. I live in the south of Taiwan, so naturally the film is set in the center or south of Taiwan. In these regions, people over 40 years old use Taiwanese on a daily basis, and these are also the people I interact with regularly. If I were to shoot a film in France or the Netherlands, I’d use French or Dutch. It would be unnatural if I used English. So I didn’t go out of my way to use Taiwanese over Mandarin Chinese to convey some particular meaning. I used Taiwanese simply because it’s the language I experience in my life. As for the cinematography being primarily black and white, with only dashcam portions in color…black and white conveys an overall sense of magical realism. Black and white not only paints a realistic picture, but also evokes a magical feeling that contrasts with the film’s realistic topics. If we shot the whole film in color, audiences would lose spatial perspective. The Great Buddha proved that black and white would work well in this manner, we kept it for The Great Bhudda+. The reason for having dascham footage in color was pretty straight straightforward: we didn’t want this movie to be black and white for the sake of being in black and white. Put it another way: when Pickle and Belly Button spy on their boss’s dashcam, it reminds me of reading gossip magazines. Those colorful magazines are a form of voyeurism that leave a lot of room for imagination. When gossip magazines talk about the lives of celebrities and social elites, even though they might have text or photos, most text is speculation, and photos are sparse. This in turn gives readers great room for imagination. When Pickle and Belly Button watch dashcam footage, they don’t really see any action; rather, they hear the action, which leaves them full of imagination. Therefore, it felt fitting to portray the same feeling that I get when I read gossip magazines. I didn’t intend to draw a contrast where lower classes live in a black and white world while the rich live in a colorful world. That’s what most critics and audiences naturally think. If it was that straight forward, I don’t think the movie would have depth. My use of color is meant to convey that sense of voyeuristic imagination. How did you transition from making documentaries to narrative film? First of all, I never had formal training with filmmaking. It wasn’t until I went to graduate school that I started studying documentaries. My school didn’t really teach us how to make documentaries, not to mention narratives, so I didn’t know how to write scripts. I like to be creative. I’ve been making documentaries for years now, and I try to think of new ways to tell stories whenever I make a new film. It gives me energy and happiness when I challenge myself creatively. I’ve always been interested in experimental films as well, but I never made any because I didn’t know how. It was same with narratives; I didn’t know how to write scripts or do shot lists. During 2013, I thought about making a short film first. But since I didn’t know how to make narrative films, I got together with two of my friends and that’s how we got things started. We bounced ideas off each other, and one of my friends would write them down as a script. That’s how I learned to write scripts. Taiwanese script formats are very straightforward. You have a first scene that shows the location, time, characters in the scene, and then the dialogue that takes place. The second scene is in the same format, and so on and so forth. Then I thought, hey, writing scripts doesn’t seem to be that difficult. We applied to the Taiwan Short Films Grant for the script, but didn’t get it [the grant]. It was quite disappointing and, as a result, I couldn’t pay my friend for her work. When 2014 came around, because of the failure from last year, I didn’t want to enlist my friend and end up not getting the film grant again. So I started writing a script [for the initial The Great Buddha short] myself. I still didn’t get the Taiwan Short Film Grant, but I applied to the Kaohsiung Short Film Grant and received around $10K USD to make the film. That’s how I started planning for The Great Buddha. I didn’t know how to make narrative films, but I have experience in advertising and knew how to communicate with actors. I found an experienced Assistant Director and crew members with experience. That’s when I got Pickle and Belly Button to be our main characters. The Great Buddha short film took three days to make and I learned a lot from that experience. I was 41 years old that year, I figured it would be difficult for me to restart my career just to learn how to make narrative films from other film productions. So I told myself I need to make this film happen, otherwise I’d probably never make a narrative film. No matter if the film turns out to be good or bad, at least I would have made a short film from this grant. 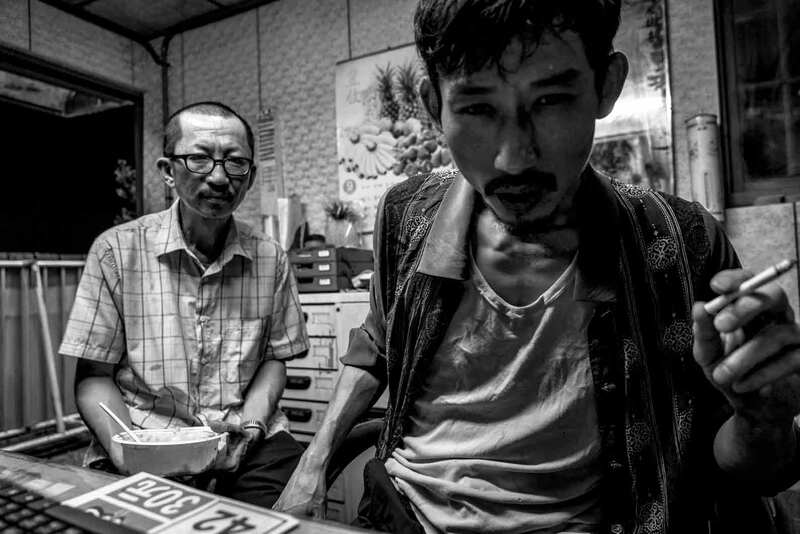 Later, this short film made it to the Golden Horse Film Festival’s short films selection, where I met The Great Bhudda+’s Producer Chung Mong-hong. He saw potential in my short film, and thought I needed a more experienced film crew to help finish the feature film, so he invested his crew and company to support the filming of The Great Bhudda+. I ended up being the most inexperienced crew member on set for The Great Bhudda+. I feel very fortunate to receive help from these experienced people. They really helped me a lot. Making documentaries and narratives are two totally different things. The logic and workflow behind them are different as well. I learned a great deal from making The Great Bhudda+. The Great Bhudda+ talks heavily about those living at the bottom of society. What were the responses you expected to get from the audience? Did you want to communicate about classism in our society? I didn’t really expect any specific response from the audience. It’s like writing a book; you finish a book and you start selling and, well, the readers will find interpretations of their own. Authors and directors are alike, they have something to say and they say it through storytelling. I think filmmaking makes me feel a bit more comfortable with life. Otherwise, if there are too many discomforts in life, some people may choose to drink and drink. I use filmmaking to solve discomforts in my life. So if you were to ask if I expected any specific responses from the audience, I don’t know. Great Bhudda+ was a way to express my ideas to others. I think life is quite hopeless—perhaps that’s pretty pessimistic. I think life has no redemption and we (humans) don’t really know why we’re here. We work so hard to have a meal; the rich buy cars and the poor buy scooters. The poorest might have nothing. And we don’t really know why we want these things. Ironically we want them because they define us. Does that mean we live to make money? I don’t know. But our society tells us we need these things. To me, I’m really just trying to explore what the meaning of life is, and why we exist in this kind of society. Because really, I think humans can be like pests to the Earth. We destroy and take advantage of our lands, we hurt animals, and we can be like cancer cells. These are questions I ask myself. But I digress. In sum, I didn’t make the movie to advance an agenda. The Great Bhudda+ isn’t here to talk about poverty or social class dynamics; these things will exist as long as humans are here. We had clans with chiefs since ancient hunter-gatherer times. Then came the middle ages with emperors, kings, nobles, peasants, even slaves. We might think our society is different because we live in capitalism and democracy, but that’s false hope. You think you have power because you can vote, but society still limits you with economic power, political power, and wealth. This is why we have bosses, elitists, the rich, the poor. [Modern life] hasn’t changed much from ancient times. The people who take care of our society have always been those who live at the foot of society. They’re the cleaners for our parks and offices; they make sure we live a good life. Is this different from the past? Not really. This is how the world works. So did I make The Great Bhudda+ to bring awareness to poverty and classism? No, I just wanted to share a story. Do you have any upcoming projects and do you plan to make more narrative films in the future? I’m finishing up two documentaries. One of these documentaries I’ve spent a few years preparing. I’m hoping to finish it up by the end of this year; all it needs is editing. I’m also collaborating with Taiwan’s Public Television Service on a new documentary about the concept of Taiwan. I want to explore the idea of what people think of Taiwan with visual imagination and abstract values. I also have plans for narrative features. As of now I’m developing new scripts. Granted, I like documentaries as they’re more introspective. The documentaries I’ve worked on these past few years are less about characters and more about personal observations. They are more about portraying topics using space, concepts, and ideas. I think making documentaries is calming, and it helps me to be more introspective. However, I don’t think narrative films conflict with making documentaries; I would even argue that they work together. Documentaries force me to go outside, move around, and see things. Maybe these things will inspire me with story ideas. My movies come from events happening in life. When I’m going out and about making documentaries, I’m within the events of life in Taiwan. So I think making narrative films and documentaries should be simultaneous, and not like [how Taiwanese stereotypically assume that one has to] focus solely on writing scripts. Since last year, I’ve been traveling a lot because of the film festivals The Great Bhudda+ got into. Seeing all these different cities in different countries, and coming back and seeing my home town—this helps me get ideas of what kind of stories I want to tell. So I like traveling. Especially when it’s for film festivals, as they take care of the itineraries. Although they’re always for a short period of time, they are nutrition for my script writing. I’m hoping to have an idea for a new script by the end of this year. It’s sort of like a piece of homework I gave myself, as I’m a believer of making things in good time. Documentaries and narratives can be shot together. In the future I’d like to experiment with one or two minute experimental films. I love making films. 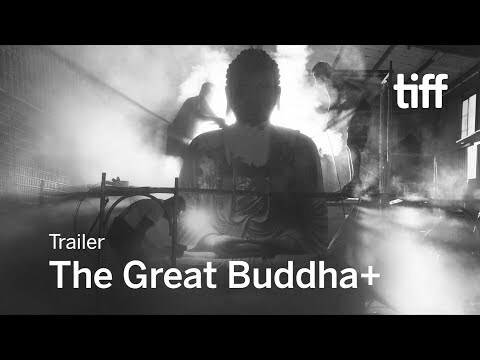 The Great Buddha+ is now available for streaming across various digital platforms including Amazon and iTunes. Click here for more details. This interview was originally conducted in Mandarin Chinese. Director Huang’s responses were translated into English and edited for clarity and length.